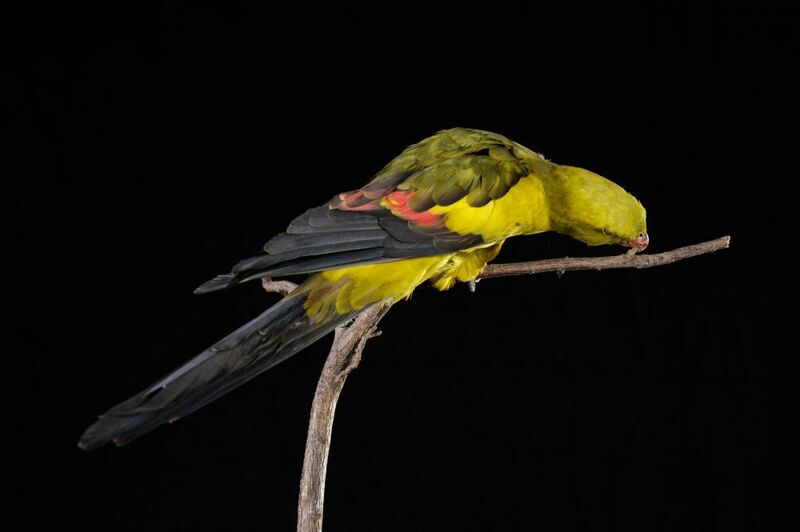 The regent parrot is a bird of the parrot family, Psittacidae. They have a yellow head, turning slightly yellow-olive on the hood and neck. The coat is olive-green, scapulars dark olive-brown. The lower back and rump appear a rich yellow color, nuancing yellow-olive on uppertail. The beak is pinkish red. The irises are orange-brown and the legs are gray. The female has a gray underside and a greener top. Juveniles resemble females, however, the young males appear more yellow on the head. They go to different habitats by region. Rather they reside in mixed plots of acacia and eucalyptus. This species is emblematic of Australia where it occurs in two distinct populations separated by several hundred kilometers. Ordinarily, regent parrots are very shy birds and very careful. Outside the breeding season, they gather in large noisy flocks thant can count a hundred birds or more. They look primarily to their land food. The populations of the east are sedentary, but it disperses after the breeding season. In contrast, the western population undertake trips that are more regular. In summer, there is dispersal movements in the south. 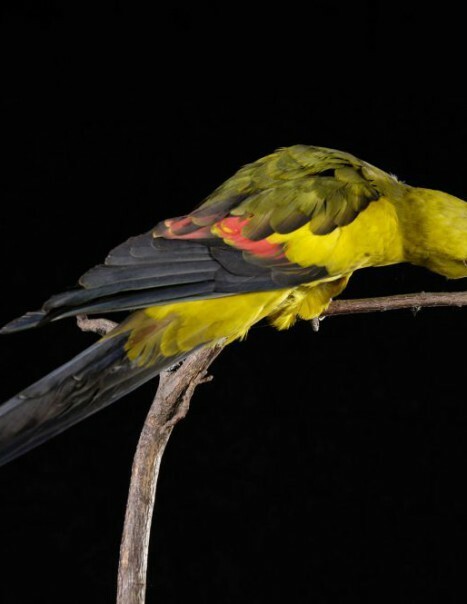 In autumn, regent parrots concentrate in the South. The nesting season runs from August to January. They nest in pairs, singly or in small colonies that can have a maximum of 18 couples. Before mating, there is ritual offerings of food. The site selected for reproduction is usually 20 meters above the ground. In a big old dead or diseased gum tree close to a permanent water course. In a deep natural cavity, it reuses this place for many consecutive years. Laying includes 3 to 6 white eggs deposited on a layer of decaying wood chips. The female incubates alone for 21 days. Its partner, comes to feed it. The chicks leave the nest usually after 5 to 6 weeks, but after fledging, they remain in the family group for a few weeks. They are exclusively vegetarian. They consume the seeds grassy plants, fruits, berries, buds and flowers, grain crops, orchards nuts, seeds fell on the roadside.